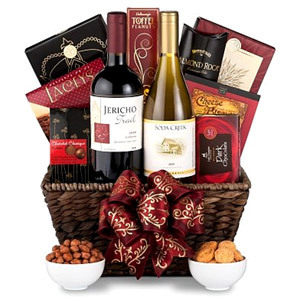 A joyous and festive holiday gift basket that is sure to be a delight. This holiday gift basket is loaded with special treats for the entire family. Tucked beautifully inside a premium handled basket they will find a vast assortment of cookies, sweets and treats along with a meal of roasted red bell pepper fettuccine with olive oil. Imagine their surprise when they peel back the Ghirardelli chocolates, Godiva hot cocoas and other goodies they find Wisconsin Hot Pepper Cheese, caramel popcorn and so much more. 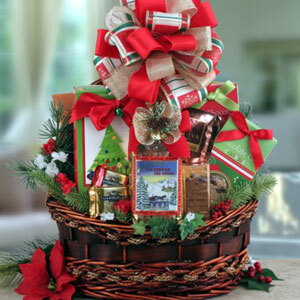 We can ship this Christmas gift basket anywhere in the USA or Canada. 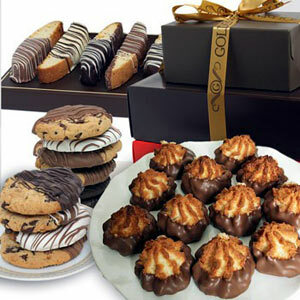 Say Happy Holidays in a delicious holiday gift basket!This Gift Includes: Christmas Tree 7 oz. Chocolate Fudge Cookies and 2 oz. White Chocolate Cocoa Roasted Red Bell Pepper Fettuccine 12 oz. w/Olive Oil 25 ml Christmas Cookie 2 Pack Chocolate Chip Cookies 2 oz. Christmas Cookie 2 Pack Triple Chocolate Cookies 2 oz. Godiva Chocolatier Hot Cocoa (possible flavors):Godiva Mike Chocolate CocoaGodiva Dark Chocolate Cocoa Two (2) Ghirardelli Assorted Chocolates .53 oz. (possible flavors)Ghirardelli Hazelnut Chocolate .53 oz.Ghirardelli Crisp Chocolate .53 oz.Ghirardelli Assorted Chocolates .53 oz.Ghirardelli Almond Chocolates .53 oz. Themed Snack Mix 6 oz. Godiva Chocolatier Milk Chocolate Pearls 1.5 oz. Los Olivos Biscuits 2 oz. Colorado Kernels Carmel Popcorn 5.5 oz. JavaBon Coffee Candy 3 oz. Seasonal Drink Selection Laceys Delicious Dark Chocolate & Crisp Almond Toffee Wafer 1.1 oz. Wisconsin Hot Pepper Cheese Bar 4 oz. Reusable Premium Handled Basket Hand Written Gift Message attached directly on gift Option to upgrade to Classic or Grand Presentation Gift Size 13" x 10" x 14" Shipping Weight 10 lbs. 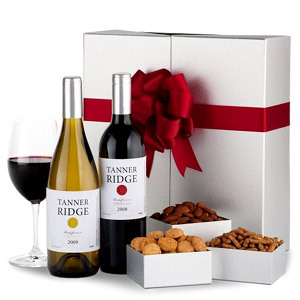 "A perfect balance of food and wine, this upscale gift basket first impresses with the prestigious selection of two acclaimed red wines: Maryhill Winemaker's Blend and Terra D'Oro Amador Zinfandel. Pairing enjoyment ensues with Godiva Chocolate Caramel Gems, Lemon Tea Cookies, Seasoned Almonds, Herbed Crackers, Camembert Cheese Spread, Moravian Chocolate Cookies, Seattle Milk Chocolate Truffles, and more. 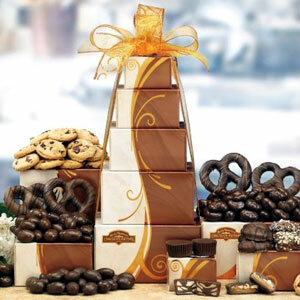 Combined within a top-stitched tray, this popular gift always makes the right impression. Measures 16' x 13' x 5'. Please NoteDue to the alcoholic content of this gift, an adult signature is required upon delivery. Wines are available for delivery only in few states, because of restrictions of the Federal Law.The states to which we can deliver are: (AK) ALASKA, (AZ) ARIZONA, (CA) CALIFORNIA, (CT) CONNECTICUT, (DC) DISTRICT OF COLUMBIA, (HI) HAWAII, (ID) IDAHO, (IL) ILLINOIS, (MI) MICHIGAN, (MN) MINNESOTA, (MO) MISSOURI, (NH) NEW HAMPSHIRE, (OH) OHIO, (OR) OREGON, (SC) SOUTH CAROLINA, (VA) VIRGINIA, (WA) WASHINGTON, (WY) WEST VIRGINIA. (Also try our gerberas, carnations, mixed arrangements, flowers, lilies, orchids, bonsai trees, cookies, toys, candles, gift hampers, crystal, barwares, tote bags, cakes, desserts, candy, snack foods, birthday gifts, anniversary gifts, wedding gifts, sympathy flowers, plants, chocolates, teddy bear, wine & champagne, gift baskets, spa gifts and christmas gifts)"
"A classic way to celebrate a special achievement milestone or special occasion is with this Champagne and Caviar Luxury Gift. 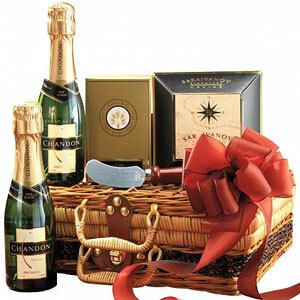 It comes inside a grand and stylish wooden case that gives a king's feel and gifts honorable moments!Recipients will be delighted to receive two splits of 187ml of Chandon California Brut Classic--one of America's premier sparkling wines--in a petite picnic hamper. We also include Saraivanov Caviar, Aaron Bell Crisp Crackers and a serving knife for easy serving.A gift they will never forget. Measures 11' x 9' x 4'. Please Note Due to the alcoholic content of this gift, an adult signature is required upon delivery. Wines are available for delivery only in few states, because of restrictions of the Federal Law.The states to which we can deliver are: (AK) ALASKA, (AZ) ARIZONA, (CA) CALIFORNIA, (CT) CONNECTICUT, (DC) DISTRICT OF COLUMBIA, (HI) HAWAII, (ID) IDAHO, (IL) ILLINOIS, (MI) MICHIGAN, (MN) MINNESOTA, (MO) MISSOURI, (NH) NEW HAMPSHIRE, (OH) OHIO, (OR) OREGON, (SC) SOUTH CAROLINA, (VA) VIRGINIA, (WA) WASHINGTON, (WY) WEST VIRGINIA. (Also try our gerberas, carnations, mixed arrangements, flowers, lilies, orchids, bonsai trees, cookies, toys, candles, gift hampers, crystal, barwares, tote bags, cakes, desserts, candy, snack foods, birthday gifts, anniversary gifts, wedding gifts, sympathy flowers, plants, chocolates, teddy bear, wine & champagne, gift baskets, spa gifts and christmas gifts)"